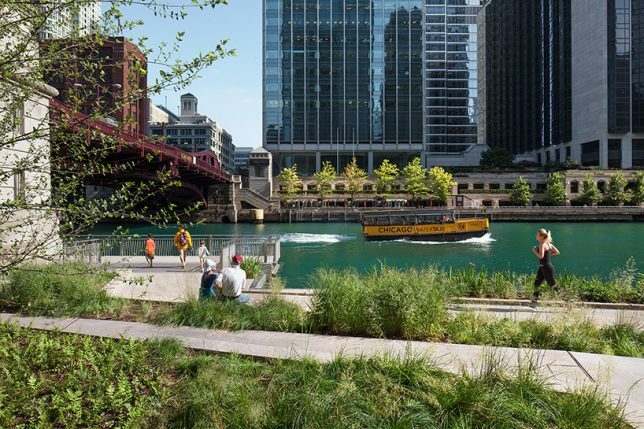 The final phase of the Chicago Riverwalk opened to the public this weekend, completing a project that connects the city’s downtown area to a previously neglected industrial waterfront. For decades or perhaps even centuries, this sort of prime real estate has been similarly misused and disused in cities all around the world, given over to factories, shipyards, power plants and other facilities that don’t exactly encourage public interaction with the shore, but the Riverwalk is part of a movement that’s taking them back. 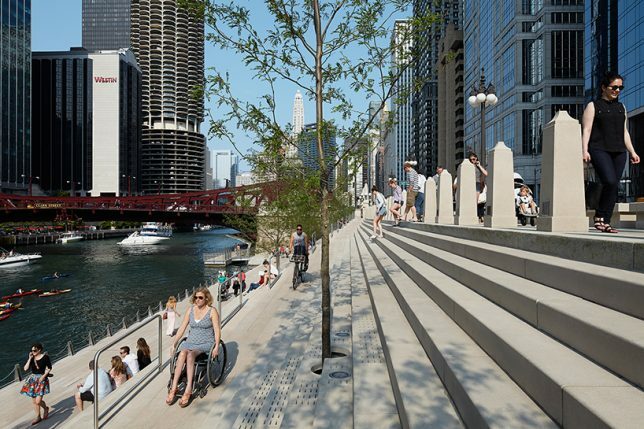 The Chicago Riverwalk development is a 1.5-mile promenade for pedestrians and bicycles that runs alongside the Chicago River, helmed by Sasaki and Ross Barney Architects. The first and second phases have been open since last year, attracting thousands of visitors to the south bank to patronize restaurants, bars and shops, and take water taxis to other spots along the river. 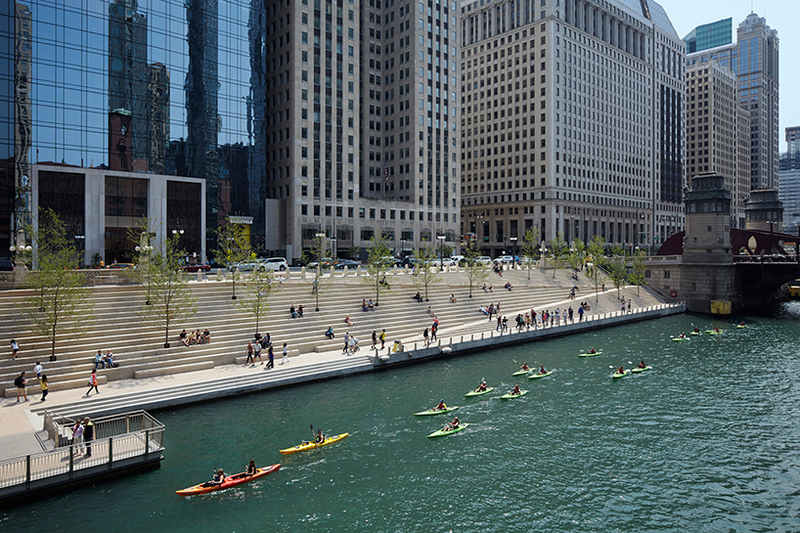 The clean modern design, which sets off the city’s historic Beaux Arts architecture to its greatest advantage, won an annual design excellence award from the American Institute of Architects, which noted that the Riverwalk “has become the city’s backyard patio.” The promenade features an expansive stepped section planted with trees, effectively creating stadium seating from which to enjoy the water. It also crosses both over and under several of the city’s bridges, so you can take a continuous riverside walk without ever encountering motor vehicle traffic. Recreation areas, gardens ,lawns and sculptural accents give it the feel of one big park, and some of the gardens float upon the surface of the water. 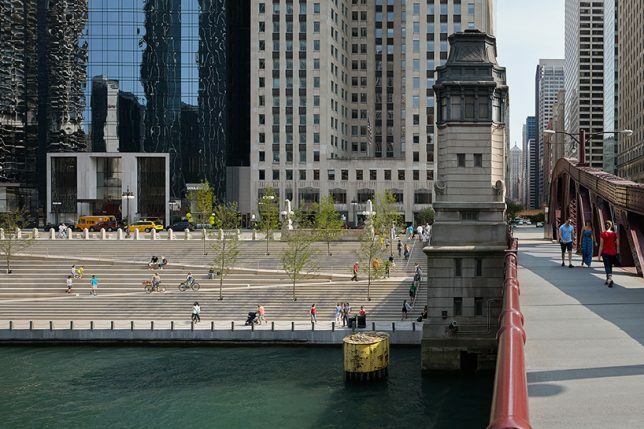 Many Chicago residents may be less than enthralled with their mayor, Rahm Emanuel, but his signature public works project seems to be going over pretty well, and it’s a valuable contribution to the urban landscape. 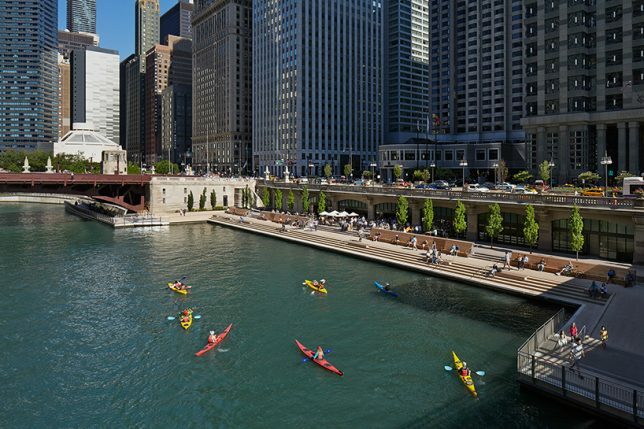 The city has already ensured that its lakefront is open to the public rather than being claimed by big businesses and wealthy landowners, and it’s refreshing to see the river get the same treatment.